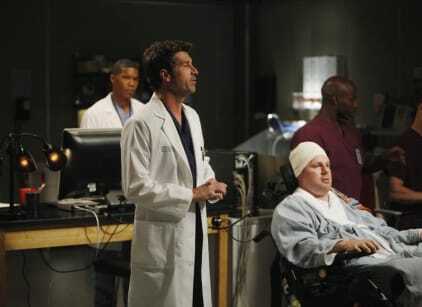 Derek and Callie teamed up for a brain-mapping project. Meanwhile, Richard proposed that his physical condition be used as a learning tool. Elsewhere, Meredith contemplates continuing her mom's research. Moreover, feelings of guilt about Heather's death plagued Shane. Meredith: You make me sound like a soft drink. Callie: Yeah, I'm reinvesting in myself. Jo: I need an ultrasound. Meredith: Are you pregnant? Does Alex know? Permalink: I need an ultrasound. Are you pregnant? Does Alex know? Grey's Anatomy Round Table: "Map of You"
Grey's Anatomy: Watch Season 10 Episode 6 Online! Grey's Anatomy Music: "Map of You"